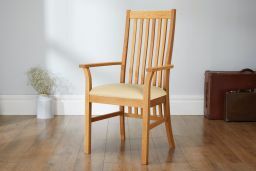 Lichfield solid oak cream leather carver dining chair with arms - You wont find better value, guaranteed lowest UK price. The Lichfield range of oak dining room chairs have proven so popular over the past few months that we decided to launch a range of matching carver chairs. Why not combine a pair of the Lichfield carver chairs with the standard Lichfield chairs to add that extra bit of class to your dining room or kitchen. We have worked hard with our manufacturer of these chairs to make sure that this new design is extremely strong and durable but also very affordable. You would easily pay between £200 and £300 each for these chairs from one of the big UK retailers. Made exclusively for us from sustainable forests in the USA. Excellent - really pleased with our new chairs. Good quality and finish. Would highly recommend them. Well built and extremely comfortable. Delighted with my purchase. Ordered online. Prompt acknowledge of order and delivery date notification. Chair arrived when promised and is well made and finished. A good experience throughout. Delivered on time, well packed and matched exactly the description on line. Seem very well made and certainly comfortable, very pleased with the purchase. Good quality furniture for a good price and good service. Our chair was delivered as promised early in the morning Thank you Top Furniture. A very sturdy, comfortable chair. Just a few marks made by a plane or similar on the centre front spindle. Looks fantastic! Needed a chair for the hall. This carver fitted the bill perfectly. service was very good prompt delivery. Everything about this was perfect, from placing the order to receiving updates on delivery,dates and times of the delivery was super. Thank you very much for your efficiency. This is a lovely, stylish carver dining chair. I bought 2 and I love the cream leather seat and the beautiful oiled oak wood. We have been looking for quite some time for the right chairs for our kitchen and these are perfect and I was surprised at how extremely competitive the price of these chairs is. They are by far the best quality we have seen, and look much more expensive that they are. We bought two carver chairs with cream coloured leather seats. They are good looking, sturdy and look great in the dining room. Because they have arms, they make it easier for my elderly mum, who has severe arthritis, to get up from the table by using the arms. Very pleased with the chairs. The quality and look of this chair is exceptional considering the price. Couldn't find anything to compare when searching online - anything similar was much more expensive. A really quality product which has blended in with the rest of our dining room furniture. Couldn't get better value for money. Very pleased with the quality of the chairs that we have ordered. Delivery arrived on the day booked and early. Communications between company and ourselves excellent. Very pleased overall . Would use the company again.